BartCop Radio Show 128 is up! BartCop radio show 128 is now online and available to BartCop subscribers. Bart comments on segments of Bill Maher including the 9-11 truth crowd heckling, Chris Matthews actually says something intelligent and other surprises. The California fires have got Bart’s attention and somebody better do something about global warming right #@$@# now! Some Mike Malloy, other bits and great music round out this week’s show. my tribute to Barry Crimmins and more! BartCop Radio show 124 is up and available to subscribers at BartCop.com. In show 124 Bart goes after another CNN reporter and the owner of the company involved in the latest mining cave-in. Trip reports from the Kathy Griffith and Pretenders concerts road trip, clips from John Stewart, music and more in this episode. 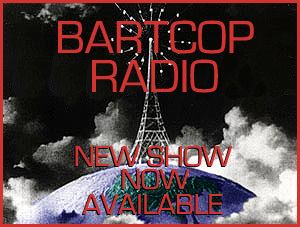 BartCop Radio show 107 is up and available to subscribers via the BartCop.com page. Bart hammers away and red-asses Hannity, Michael Weiner, Newt, the other Limbaugh (more stupid than his brother?!) and the monkey. Clips from Al Franken, Mike Malloy, Randi Rhodes and more! BartCop Radio show 105 is available for subscribers. Bart blisters the minimum wage at the Backyard Burger, Dems attacking Hillary, Private Green is yet another tragedy from the Iraq mess, Bush’s “balanced budget” BS, the mediocrity and clutter of local TV “news”, weather and programming or how Bart got to be the smartest man in Oklahoma. Throwing the yellow flag on 3 different newspaper’s opinions of Bush’s 2007 State of the Union Lie, letters to the editor and Fortune Magazine’s explanation of why the price of oil dropped.